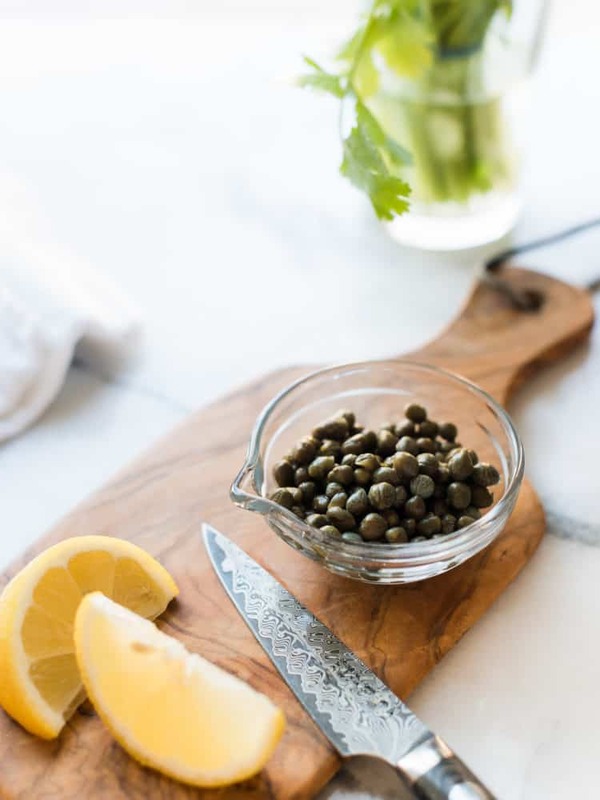 Grilled Mahi Mahi with a simple onion and capers sauce is so simple and elegant, it will surely become a favorite fish recipe. You can also make this grilled mahi-mahi recipe in the broiler or simply pan-seared! Have you ever tried to solve a Rubik’s cube? I remember trying my hand at it when I was little, and I would always fall short of solving it. Who am I kidding, I would be lucky if I got two sides! Little did I know that many years later, Rubik’s cubes would still be popular, and for my son, his obsession started a few months ago. He started with a cute little 2×2, and I was instantly amazed at how quickly he solved that little puzzle. He moved on to the 3×3, the 4×4, and now he’s obsessed with things like the Pyraminx (yes, it’s the shape of a pyramid) and the Megaminx (a dodecahedron puzzle). His brain somehow understands the algorithms it takes to solve these puzzle cubes and whenever he has free time, I can hear him practicing, getting faster and faster. He told us about world records and competitions and pretty soon, he was researching competitions here in the Bay Area. So, can you guess what we did this weekend? I felt like I walked into another world. As the organizers were setting up, you could hear the steady clicks of dozens of cubes being swished around at lightning speed, and I whispered to my husband, “there are more of them!” My mind was boggled, especially as the various events began. Did you know that people can solve them one-handed? And blind-folded? My son was so happy — making new friends, trying for personal bests, learning new algorithms — and I was so proud of him for just wanting to go! We saw some crazy times on some solves (1.9 seconds on a pyraminx drew gasps from the crowd), and I just kept thinking of the brain power in that room. Later that day, as I shopped at the market, the wheels in my own head started turning — I needed something lightening quick for dinner, something wholesome to combat the weekend’s indulgences. Fish seemed like the perfect thing, and for a minute I thought of fish tacos. But then I spotted some gorgeous mahi-mahi at the market and remembered a simple recipe with pantry staples. 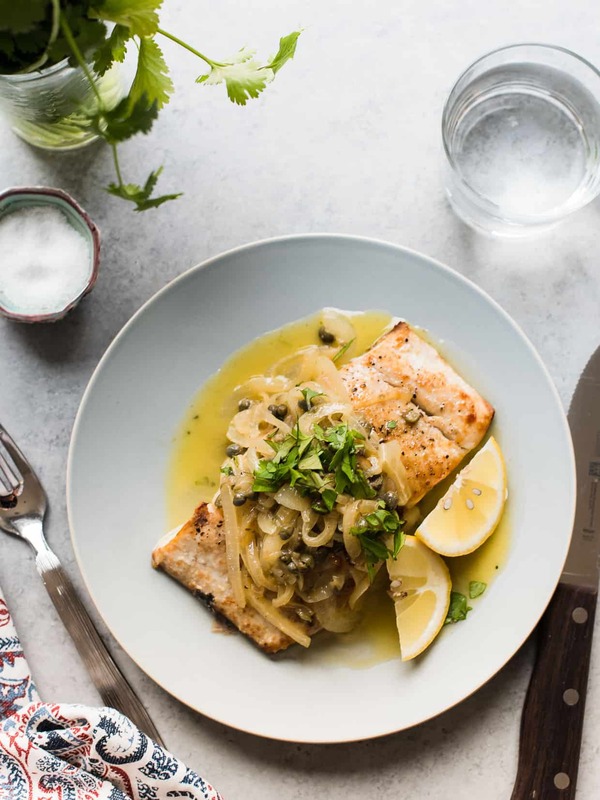 Thinly sliced onions melted down into a sweet sauce with bright, briny capers and a touch of lemon cooked in just minutes as the mahi-mahi grilled. I timed myself. It wasn’t 1.9 seconds, but it may be a new personal best. A simple grilled fish takes minutes to prepare, making it easy for weeknights! 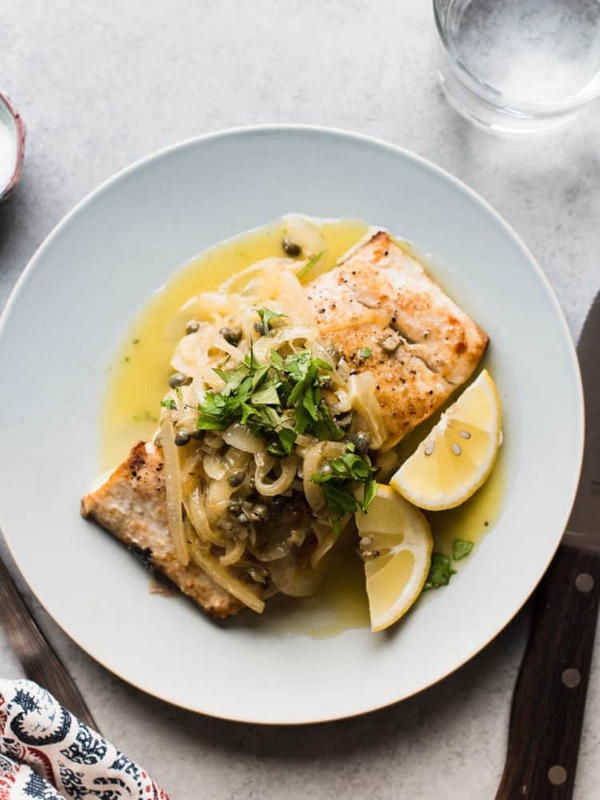 This Grilled Mahi Mahi with Onions and Capers is full of flavor and can be made in about 15 minutes. Using 1 tablespoon of olive oil, brush the fish on both side with the oil and season generously with salt and pepper. Place the fish skin side down on the grill and cook, covered, for about 8-10 minutes. While the fish cooks, heat the remaining olive oil in a pan over medium heat. Add the onion, season with a little salt and cook, stirring occasionally, until the onions have wilted, about 5 minutes. Stir in the water and cook for another minute more. Add the butter, capers and lemon slices. Stir as the butter melts, then set aside, keeping warm. 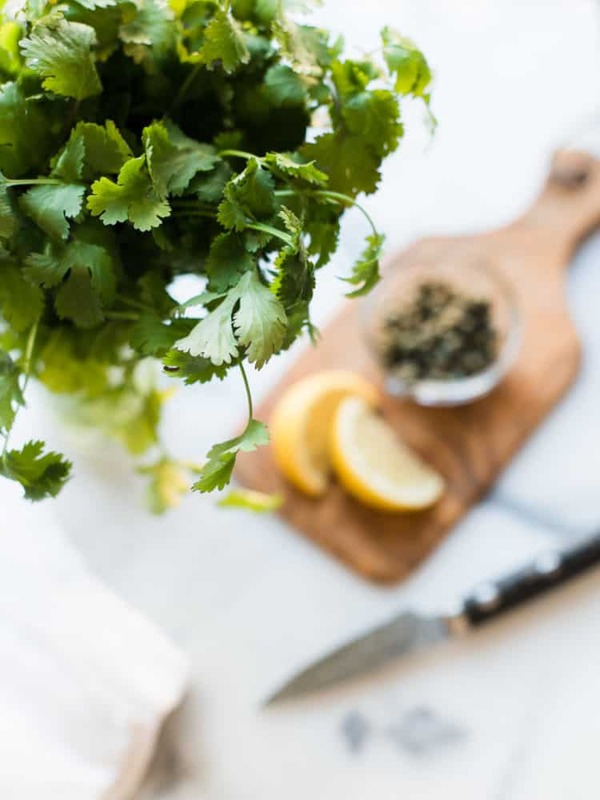 Place the mahi mahi on a serving plate, top with the onion and caper sauce and garnish with cilantro. Serve immediately with any remaining sauce on the side. This recipe can also be prepared in the broiler or pan seared on the stove. To broil: Preheat broiler. Place fish skin side down on a broiler pan and broil for about 8-10 minutes. To pan-sear: Preheat a lightly oiled skillet on medium-high heat. Place fish skin side down and cook for about 5 minutes. Flip and cook for about another 5 minutes more. 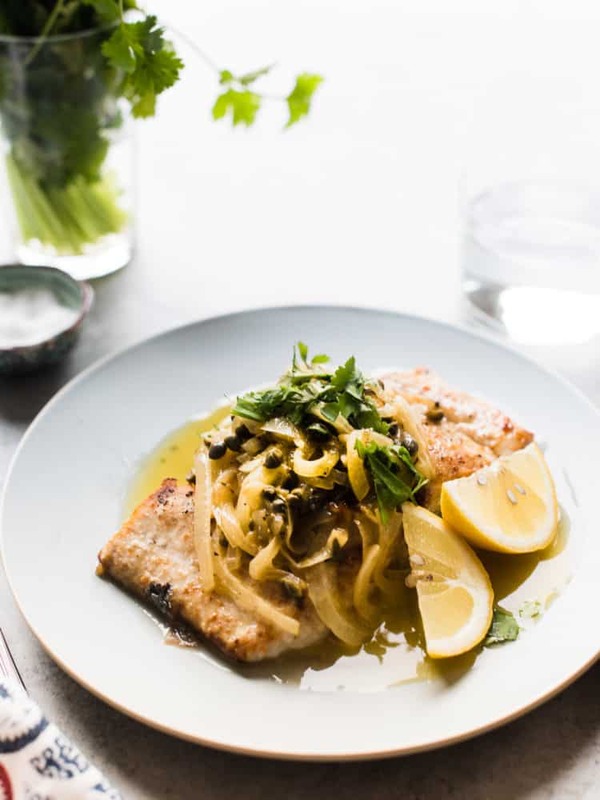 Adapted from Mahi Mahi with Onions, Capers and Lemon, Gourmet (April 2006) via Epicurious.